Lee Nordbye is a landscape and astral photographer based in Calgary, Alberta. A self-taught photographer, Lee has been photographing since he was a child. However, it has been only since the last couple of years did he start calling himself a photographer. What appeals to Lee the most about living and working in Canada are the camaraderie of other Canadian photographers as well as the beautiful and rugged Canadian Rockies. Lee speaks to atlas this week about how he is drawn to nature, the challenges behind astral photography, and where in Canada he wants to photograph next. Lee Nordbye: I have enjoyed taking pictures since I was a child. Prior to 2015, however, I simply took pictures documenting life events and travels. It is really only in the last 16 months that I consider myself to be a photographer. Photography is a part time passion of mine with hopes of someday turning photography into a full time career. You focus on landscape and nature photography. What about nature appeals to you? Throughout my life, most of my recreational activities have been centered around enjoying the simple beauty that mother nature provides. My family and I spent time camping, fishing, hiking in the mountains and exploring Northern Alberta. Dad spent time capturing wonderful images of the family enjoying the outdoors. He inspired me to get into photography through his passion for it and participating in the outdoors. I also enjoy the serenity that comes from being in the outdoors. All the thoughts from my hectic day-to-day life disappear each time I am in the mountains. During one of my snowshoe trips this past winter, I stopped, took a deep breath of the fresh mountain air and said to myself, “This is what life is about – peace, quiet and calmness.” A cliché perhaps, but it is a big reason for my enjoying landscape and nature photography. How has living in Canada influenced your photography career? The people and place come immediately to mind. The people: I have had the very fortunate opportunity to meet and develop friendships with some amazing Canadian photographers. Dave Brosha and Paul Zizka are the two that have influenced me the most. Paul lives in Banff, Alberta. Over time we have developed not only a great photography relationship but a great friendship. Dave lives on the east coast. However, through workshops and technology, he has been a great mentor and also become a great friend. Without meeting Paul and Dave, I would not be where I am at today. The place: I live one hour away from one of the most beautiful places on earth — the Canadian Rockies. Their beauty and ruggedness are a daily inspiration. 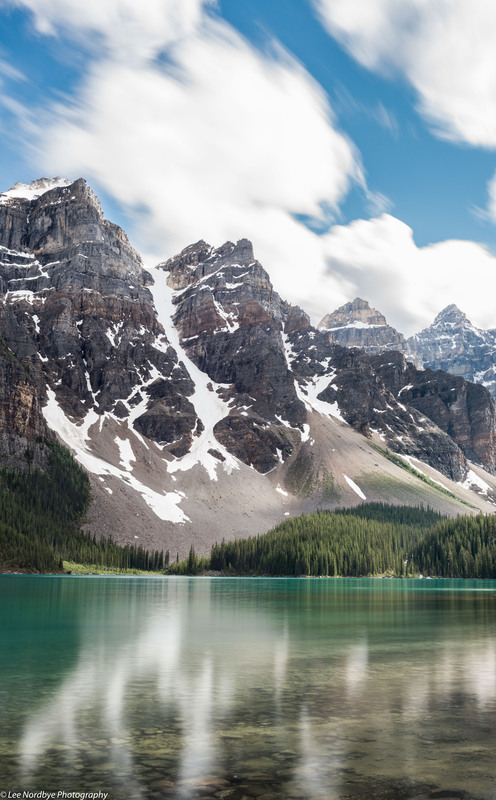 In addition to the Canadian Rockies, the Canadian landscape offers an incredible variety – the Canadian north, the rugged west and east coasts, the prairies, and more. Outside of a few night courses and workshops, I am pretty much self-taught. It is amazing what a person is capable of doing and learning when you open yourself up to hard work, constructive feedback and a willingness to stretch yourself well beyond what you are comfortable with. How did you get interested in astral photography? Is shooting astral images easier or harder than shooting landscape photography? Growing up in Northern Alberta, I was always interested and fascinated by the northern lights. When I took up photography, I thought it would be fun to capture Lady Aurora. Spending time in the dark, alone staring at the night sky while photographing the aurora, I became fascinated by the night sky’s spirituality and mysteriousness, inspiring the need to capture these moments. Technically, shooting astral is a lot more challenging than landscapes because of the lack of light. The goal is to find the right settings to capture the scene while getting everything as sharp as possible and minimizing the amount of grain in the photo. This can be a real challenge in very dark nights. However, in terms of composition, I find astral a lot easier than landscapes. The darkness helps to eliminate a lot of the chaos and mess that is often found in the fore and mid grounds of landscapes. Any areas in Canada that you want to explore and photograph? The Canadian North – from the Yukon to Nunavut. I am inspired by the roads less traveled and to me the Canadian North screams less traveled. I have spent a little time in the Yukon and around Yellowknife in the North West Territories. What little I have seen so far was amazing and is worth so much more time to explore. I am also very inspired by the landscape work of local Nunavut photographer, Curtis Jones. Wayne Simpson of Elnora, Ontario. Wayne is a creative portraiture and landscape photographer. I started following his work late in 2015. As I followed Wayne, I began to really admire his creativity in both his portraiture and landscape work, inspiring me to really up my creativity game in 2016. I would love to see him work first hand. No specific projects, but I have a goal of spending time in the backcountry of the Canadian Rockies this summer and capturing aurora and icebergs in Greenland in September. Can you tell us more about these beautiful images? 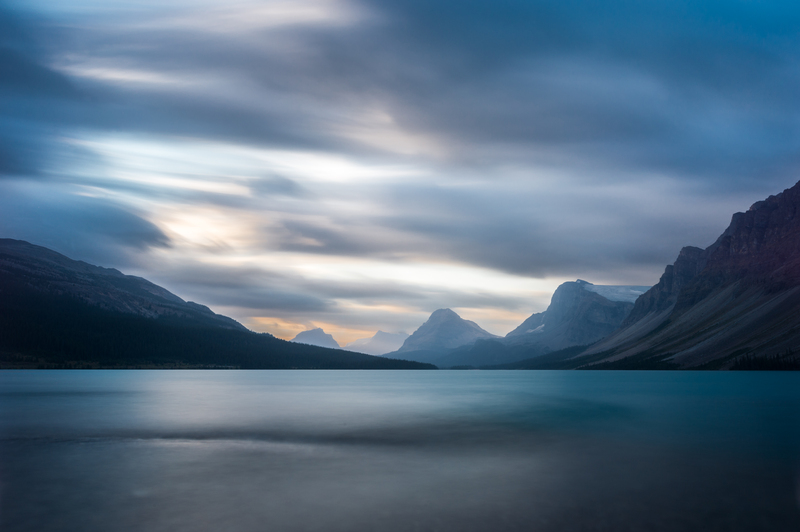 The top image is called “The Moody Blues.” This photo was taken at Bow Lake in Banff National Park. It is taken from the traditional perspective near Num Ta Ja Lodge. Leaving Banff early late August morning, I was excited by clear conditions with some fluffy white clouds in the sky. In approaching Bow Lake, it became very cloudy and the conditions were not looking promising. However, when I arrived at the lake, the wind picked up and noticed that the clouds were moving quickly just at sunrise, creating a perfect moment for a long exposure. I wish I could say I planned to create the water structure in the foreground. I was fortunate to get this structure where the waves and creek met. It adds a unique element to the photo. 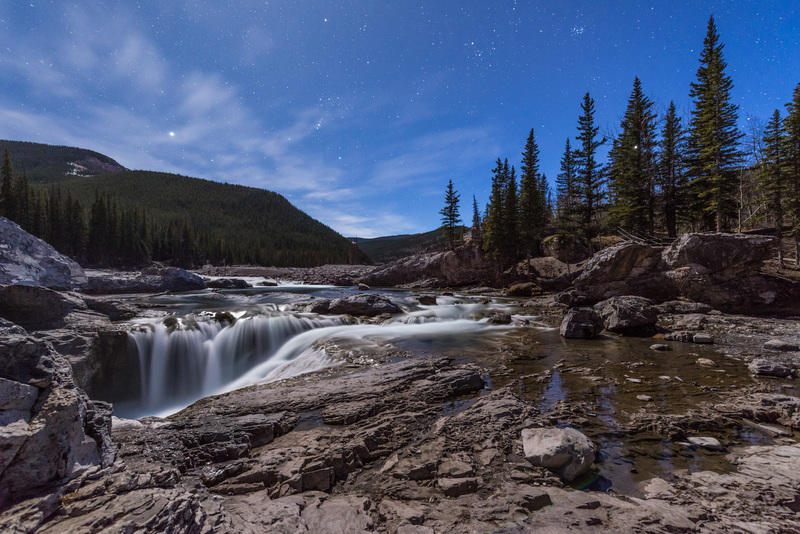 The second one is called “Falling over Orion.” This photo was taken on a beautiful moon lit night at Elbow Falls in Kananaskis country west of Calgary, Canada. I was photographing the moon and the falls on the right side of the photo when I looked up and saw that Orion was in the perfect spot. I immediately changed position and was able to capture this moment. The moon was in the perfect position to light up the falls. 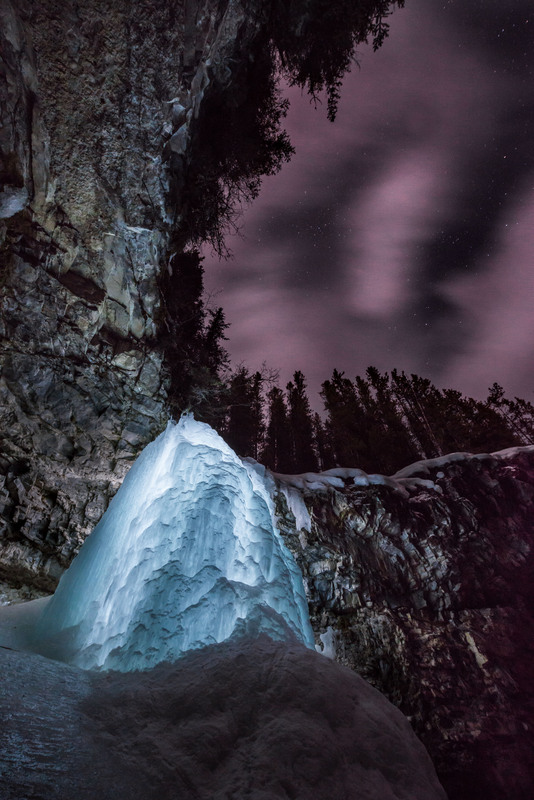 The third image is “The Blue Amethyst.” Fellow photographer friends, their wives, and I set out for a fun night in February in Kananaskis country. After a pub dinner and a drink, we set out and hiked into Troll Falls. We had no idea what to expect as none of us had been there. A friend brought a powerful flashlight so we set it behind the falls to see what we could capture. A fun night with no expectations of getting great photographs turned out to be a very fun night and a couple of cool shots, including this one. 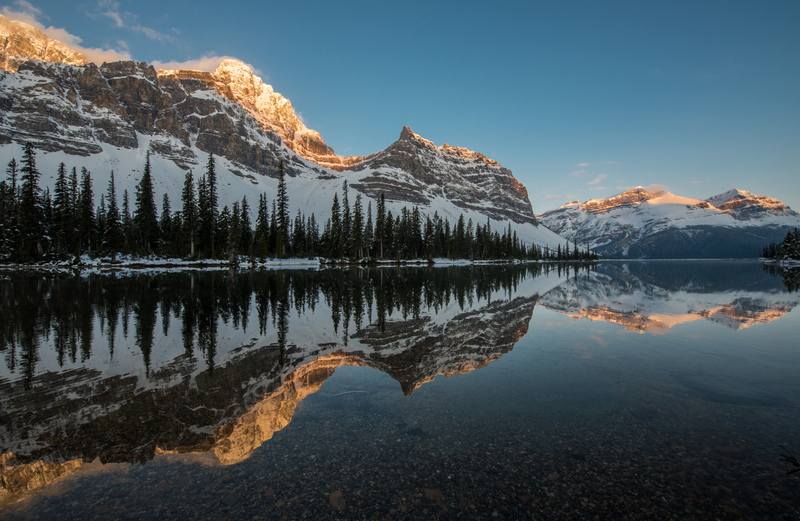 The fourth one is called “Ridge of Light.” This photo was taken at the iconic Bow Lake in Banff National Park. The vast majority of photos of Bow Lake are taken from the north end of the lake near the Num Ta Ja Lodge. A good friend and fellow photographer, Trent Enzol from Lens on Nature, set out from Calgary at 3 a.m. to catch the sunrise at Bow Lake in mid-May this year. To get a different perspective, we headed into the south end of the lake and when we got to it, we were treated to mirror like conditions on the lake. The mirror like conditions and the alpen glow on the mountains created this great opportunity to capture the ridges of Crowfoot Mountain on the left and Mount Simpson in the background. The last image here is “The Ghostly Moraine.” This photo was taken at another iconic lake in Banff National Park called Moraine Lake. When we arrived at the lake, there was very flat lighting conditions. However, when in the mountains the weather can change quickly and dramatically at times. A couple of us decided to walk towards the other end of the lake to see what opportunities presented themselves. During this time the wind picked up and the clouds broke, creating better lighting conditions. The snow on the mountains was creating a ghostly-like reflection in the water. A slow exposure helped to give it the ghostly feel I was going for. Thanks for being our featured photographer of the week, Lee! For more information about Lee, visit his website. All images © Lee Nordbye.